Family-friendly places like Beto Carrero World and Praia De Quatro Ilhas will thrill your kids. Explore Bombinhas' surroundings by going to Itapema Beach (in Itapema) and Praia das Laranjeiras (in Balneario Camboriu). And it doesn't end there: tour the pleasant surroundings at Bombinhas Beach, enjoy the sand and surf at Bombas Beach, make a trip to Vista Panoramica, and see the interesting displays at Parque Ambiental Familia Schurmann. To see photos, traveler tips, where to stay, and other tourist information, you can read our Bombinhas trip builder site . Sao Paulo to Bombinhas is an approximately 3.5-hour combination of flight and taxi. You can also do a combination of bus, flight, and taxi; or drive. In January, daily temperatures in Bombinhas can reach 34°C, while at night they dip to 25°C. Finish up your sightseeing early on the 29th (Tue) so you can go by car to Blumenau. On the 30th (Wed), tour the pleasant surroundings at Praca Hercilio Luz, admire the landmark architecture of Castelinho da Havan, admire the striking features of Catedral Sao Paulo Apostolo - Igreja Matriz, then examine the collection at Museu da Cerveja, then admire the landmark architecture of Blumenau City Hall, and finally enjoy some diversion at Vila Germanica Park. 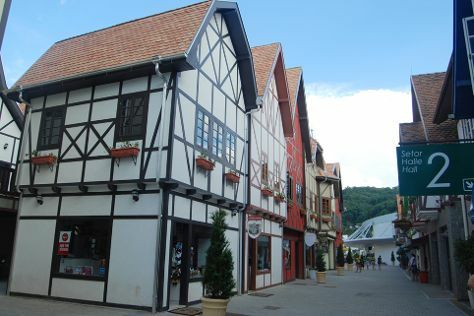 To see reviews, where to stay, and more tourist information, read Blumenau online driving holiday planner . Traveling by car from Bombinhas to Blumenau takes 1.5 hours. Alternatively, you can take a bus. In January, plan for daily highs up to 34°C, and evening lows to 26°C. Finish your sightseeing early on the 30th (Wed) to allow enough time to drive to Pomerode. Founded in the 1860s by Pomeranian Germans, the small town of Pomerode boasts a well-developed tourist infrastructure that makes it a popular vacation destination for thousands of foreign visitors. On the 31st (Thu), appreciate the extensive heritage of Centro Historico, contemplate the long history of Portal Turistico Sul, then stroll through Vila Encantada, and finally tour the pleasant surroundings at Zoo Pomerode. To see ratings, more things to do, where to stay, and tourist information, read our Pomerode day trip website . You can drive from Blumenau to Pomerode in an hour. Another option is to take a bus. Expect a daytime high around 34°C in January, and nighttime lows around 26°C. Finish your sightseeing early on the 31st (Thu) to allow enough time to travel to Rio Negrinho. Rio Negrinho is a municipality in the state of Santa Catarina in the South region of Brazil. On the 1st (Fri), stroll through Praca do Aviao and then get out on two wheels at Centro de Eventos Fazenda Evaristo. To find maps, ratings, traveler tips, and more tourist information, you can read our Rio Negrinho tour itinerary planner. Traveling by car from Pomerode to Rio Negrinho takes 2 hours. Traveling from Pomerode in January, things will get little chillier in Rio Negrinho: highs are around 30°C and lows about 19°C. Finish your sightseeing early on the 1st (Fri) so you can travel to Mafra. Mafra is a city located in the northern border of the state of Santa Catarina, Brazil. Kick off your visit on the 2nd (Sat): tour the pleasant surroundings at Parque Ecoturistico Municipa Sao Luis de Tolosa, then don't miss a visit to Parque Ecoturistico Municipal Seminario Serafico Sao Luis de Tolosa, and then examine the collection at Museu Da Terra & Da Vida. For photos, maps, more things to do, and tourist information, go to the Mafra trip itinerary planner. Drive from Rio Negrinho to Mafra in an hour. February in Mafra sees daily highs of 31°C and lows of 20°C at night. Finish your sightseeing early on the 2nd (Sat) to allow enough time to travel to Sorocaba. Well-connected to nearby Sao Paulo, pleasant Sorocaba remains an underrated gem. On the 3rd (Sun), admire nature's wide array of creatures at Parque Zoologico Municipal Quinzinho De Barros and then cross one thing off your bucket list with a skydiving experience. To see other places to visit, where to stay, and more tourist information, read Sorocaba day trip planning website . The Route module can help you plan travel from Mafra to Sorocaba. When traveling from Mafra in February, plan for a bit warmer days in Sorocaba, with highs around 35°C, while nights are about the same with lows around 22°C. Finish your sightseeing early on the 3rd (Sun) to allow enough time to drive back home.